The Schwalbe Marathon Winter is a studded tyre which provides extra grip on ice for winter usage in extreme conditions. The sizes available fit some small wheeled bikes as well as most town bikes, touring bikes, cyclocross bikes and even 29" wheel mountain bikes (though 35-622 will look narrow on these). 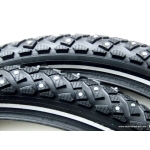 The Marathon Winter tyres are available in a limited choice of sizes. 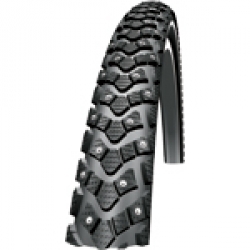 If the Marathon Winter is not available in your size we find that the Schwalbe Marathon and Marathon Plus, while not studded, also are a good choice for winter conditions, but they don't offer the grip on ice which you get with these studded tyres. The tyres are fairly expensive. You can economise by fitting one to a bicycle. If you do this, we recommend that it is fitted to the front wheel as losing traction at the front almost always results in a nasty and uncontrollable fall. For tricycles with two wheels at the front and velomobiles, we suggest that a single studded tyre be used at the rear. Otherwise you run the risk of losing directional control and the bike flipping over when the tyres regain grip. To avoid confusion in size, we use the ETRTO tyre sizes. These consist of two numbers giving width and rim diameter in millimetres. If you are buying replacement tyres then your existing tyres will have these numbers on their side-wall. In many cases, a slightly wider tyre can be fitted for more comfort, but take care of clearance for mudguards, brakes and frame tubes. The Schwalbe Marathon Winter has both a reflective sidewall for safety and a dynamo track to optimise working with a dynamo lighting system. We try to keep the tyres in stock but if we run out it can be difficult for us to get them once winter is in progress and demand is high. 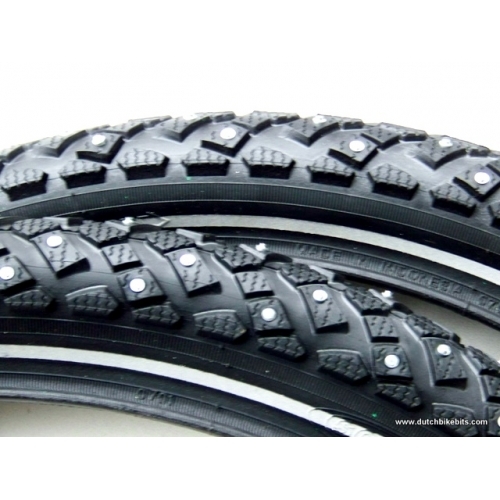 Therefore, we advise that you consider ordering your Marathon Winter studded tyres before the freezing weather starts. 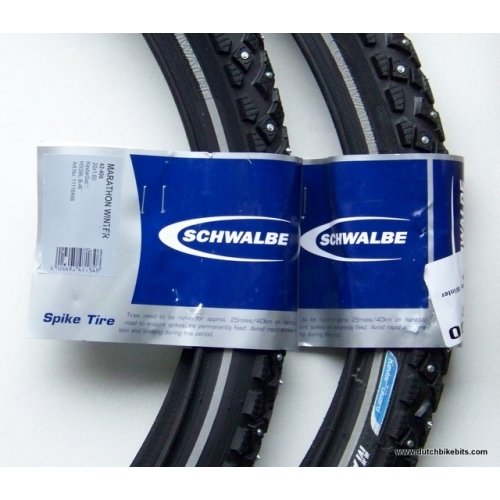 See also the Schwalbe Winter tyre, which is similar with fewer studs, has different sizes, and costs a little less.